Plenty of people jump to defend Fidel Castro on the heels of his death. I don't believe he needs that. He lived in prosperity while many in Cuba went without. Many people were denied access to their own families, to practice their religion, speech and democratic rights in a reasonable manner. Castro doesn't need defense because he is not on trial and he lived well. What does need defense is the sovereignty of Cuba, the advancements made by Cuba, and the birthright of Cubans to institutions which allow them to enjoy medicine, education and housing which in many ways rivals that of liberal democracies, often with better safety nets. Cubans enjoy a state where activists, organizers and labor unions/progressive politicians are not victims of killing campaigns and paramilitary forces which act with impunity and rival state power in their ability to commit violence. Cuba could have experienced this terror, endemic to states like Colombia and Honduras. Instead, Batista was overthrown, and private US power was no longer grafted to the Cuban state. "The corruption of the Government, the brutality of the police, the government's indifference to the needs of the people for education, medical care, housing, for social justice and economic justice ... is an open invitation to revolution." Ever since Castro overthrew this illegitimate regime, the property owners - most of whom benefited from this corrupt system backed by the brutal & illegal Junta - have demanded redress. There are likely reasonable cases among the property owners, claims which should be fairly prosecuted. Nonetheless, overthrowing this unaccountable regime benefited Cubans enormously - it is no accident that infant mortality, life expectancy, literacy and housing rival or exceed many liberal democracies. Quite a bit needs to change in Cuba, and poverty, repression and the democratic deficit are very real concerns. But Cuba also has a right to resist the introduction of the death squads endemic to Latin America - often trained and directed by the US CIA. In this doctrine, political parties are not repressed, but eliminated wholesale by extrajudicial killings. This policy of liquidation persists today. This is not a comparison of moral accounts, but of alternatives. Without overthrowing Batista, this terror would have been realized. Nonetheless, it's not enough to be better than the alternative. Now the Cuban state should be made answerable and make whole the rights of the Cuban people. Most of the criticisms of Western states are fair, and Cubans should be asked - by an empowered democratic process - how they want to live. All that is reasonable. It is also reasonable to resist the dominance of a patronage system and the intervention of US military and intelligence power, which has been deadly where it acts with impunity. The Cuban people deserve freedom from that terror just as much as they deserve democratic empowerment and a transparent government. The US and Russia have agreed to terms in furtherance of a partial ceasefire in Syria. This could be an important step to bring peace to Syria, but it leaves huge gaps which allow for impunity among the actors currently inflaming the conflict. To proportionate use of force (i.e., no greater than required to address an immediate threat) if and when responding in self-defense. I still believe that a policy of annihilation is not legitimate, even when focused on ISIS. The history of abuses pointed at Sunnis in Iraq & Syria reveals that there are communities which are vulnerable and have no other authority to turn to. If states like Russia, France and the US can get away with crimes and move forward without penalty or prosecution, then the same is true of other entities. It is not legitimate to prosecute a war of destruction in the name of justice. Of course IS must be defeated to a certain extent, and like other repressive states, it must be pressured into reasonable compromises and decent treatment of minorities. I am not convinced that there is really a fog of war which makes it hard for states like Russia to pick out IS targets from others, and they have definitely wasted any credibility they had with some of their claims. However other states like Turkey and Saudi Arabia have similar credibility issues, and there is the nasty business of Qatar and the US also disseminating arms recklessly (or even explicitly against their proclaimed strategy of supporting "moderates). ISIS is not a CIA front but US & GCC policies, including arms shipments and the liquidation of the Iraqi state institutions, definitely were meant to destabilize the state with the understanding that Islamists would fill that space. Iran, and its nominal proxies in Shia Iraq also play a huge role in making life hard for Sunni. The new Iraqi state is more legitimate than the Sunni Baathists, but the sectarian divide has reduced religious pluralism there. Iran suffered an invasion from Iraq under the previous regime, so it was almost inevitable that democracy in a Shia-majority state with inflamed sectarianism and a liquidated political class would turn the tide the opposite way. This is actually a very strong case for engagement with Iran, Iraq and Damascus regarding ways to protect the Sunni minority which are largely courted by ISIS, and form the backbone of their state, having suffered persecution. These communities are usually infiltrated and blackmailed into joining ISIS, and they literally had no authority to go to for protection. It is very unreasonable to expect those Sunni to surrender even if they can be 'liberated' from ISIS' grip. With each new iteration of destruction, prospects for a peaceful outcome grow ever more dim - it will take decades to build confidence in legitimate state institutions, and an increasing level of care to insure that past abuses do not re-emerge and force a new conflict between people who are prepared to take up arms once again. The headline speaks for itself: Office implants employees with microchips. What if the implants were mandatory? Will this bear a new era of foregone civil liberty, with a proprietary (unknowable) piece of technology embedded where it can track, record, measure and transmit you only to the limit of contemporary technology? Of course this is where civil libertarians will focus - and it is a reasonable area of focus, but it is not the most egregious example of such an authoritarian, undemocratic future. This is not happening in a vacuum - companies and governments will probably step very lightly in implementation, at least where they lack impunity, due to the potentially high profile of such implants. Considering the opportunity presented by smartphones as tracking devices, it may not even be very necessary as a kind of espionage - possession of a cellphone, and then officer use of Stringray technology, can pinpoint your general area and then your location in a house respectively. Additionally, it has been made clear that the NSA bulk data collection was never limited to metadata (remember that is the "innocuous" data: the times, participants, length etc. of phone calls). While civil libertarians at the time debated what metadata could tell us about a cell phone user, the reality was that the actual content of calls, and texts, and online communications, were being recorded completely and with trailing/marginal data intact. Much like the phantom "Taliban" in the Kunduz MSF hospital, the metadata "limit" was a rushed, dishonest mischaracterization of the facts meant to indemnify the government and private actors responsible. The truth, confirmed by Wikileaks and Snowden both, in documents tacitly confirmed by gov't statement, is that whole "trunks" of the internet were/are copied fully and constantly. Now, NSA has scaled back its illicit involvement in bulk data collection, which was illegal from the start of the program, but has now shifted to private (contracted) collection, storage and dispersal of the data. In fact, it is safer and less damaging to civil liberty to have that controlled by a (democratic) state with strong data protection - countless private firms, with different data processing models, are less capable/likely to protect (and destroy) the data. While illegally acquired, your personal data should neither be offered to other private parties by shoddy protection, sale, or otherwise. As important as privacy is, the real threat to civil liberties, democracies and civil society is in the underlying process of consent, an emergent property of which is represented in the "offering" of microchip implants to employees. Ostensibly, these implants are purely voluntary. In fact, if the labor market would bear such an obligation, it would also be mandatory for employment as normative/behavioral obligation enforced de facto as routine operation. Submitting to such tracking devices is not the only "voluntary" choice companies expect their employees to make. 'Coming out' is also voluntary. Revealing your religion, practicing religious observations/dress, eating lunch, smoking a cigarette - all voluntary. And every single one of these have been met with intimidation from employers unwilling to approve of basic workers' rights, with a legal or legislative response. Legislation and law cannot solve the problem without an active, penetrating regulatory presence in the workplace. Simply put, without a positive enforcement of your right to be free of microchip implants, there is no reason for workplaces not to employ intimidation - be it overt, yet confined to the controlled dungeons of a modern workplace, or underhanded, normative behavioral expectations. In public venues, human beings have a right to basic civil liberties. In a private workplace, the civil liberties you can expect to enjoy are not only limited legally, but those few (critical) liberties enshrined in law are easily circumvented. That is because the market will bear this limitation on rights, as a cost of employment. If "everyone else" has microchips, you will need one, too. As the population is saturated with them, untold numbers of technologies - with no obligation to work for those lacking chips - will "innovate" by assuming its clientele all have the chips. Employers will front-load aptitude tests, made more efficient by accessing implant data - applicants who do not fit this mold will be dismissed as a matter of course, without malice. That is how markets work: they enforce normative behavior by including it as a cost of employment, admission, etc.. Without the protection of law, or another form of civil society engagement, you can be expected to do anything - should the markets bear that price. Regulations will mitigate only the abuses that could destabilize the market. The alternative is democratic control over these venues. It's very simple: either you control your life when you go to the park, establishments or your work, or someone else does. Without a democratic voice and a voluntary right to choose what behaviors you will submit to, you risk becoming a vassal to a property holder - who in turn has the privilege of being your benefactor, thus adding guilt on top. No level of political and economic awareness can stifle this guilt. It stems from a simple fact: you know that your benefactor (employer) is hosting and benefiting you with their own property. They could always ask for more, and would be in their rights to do so. The guilt comes from knowing that they have this awareness - your own awareness does not matter. If such a byzantine form of guilt can be immutable, how should you expect to resist market demands which are not simply feelings, but manifested, normative behaviors? I have heard some different concepts of what "capitalism" is, ideas ranging from Marxists to An-Caps, and I have to say that (as with "communism") it does little good to focus on semantics. If you advocate for something, you best represent it by stating that idea in plain language, without such divisive terms. Nonetheless, capitalism is an economic system based on private ownership and accumulation of property, especially the means of production. There are idealists with various stipulations and caveats for their own brands, ranging from mutualism to monarchism (yes, I've heard from all of these kinds). And even from trusted materialists and journalists, I have seen limitations such as excluding derivatives markets and other, non-production-based situations. What the Federal Reserve does, and what companies, banks and corporations do in the US, is very much a form of capitalism. And yet the US does have the most regulated markets in the world - institutions dug in more than even UK ones - and even, in many ways, the closest thing to socialism the world has seen. The Federal gov't, based on representation and legitimization (legally and politically), exercises its influence on the markets within specified authority. As an element of this, the Federal Reserve acts to insure the stability and value of the US dollar, as well as setting interest rate targets and (presumably) maintaining a specific level of employment. The latter (maintaining employment) has been repeatedly drawn into question as a policy, even since the beginning of the Federal Reserve - which brings me to my main point: the Reserve, like other institutions in a capitalist (or private, for-profit) economy, acts within the bounds, and ultimately for the interests, of the power-possessing individuals and institutions. In capitalism, that is the owners of the means of production.If not, then it is a group of individuals who soon will own those means of production. Capitalism is a model of economics which goes back to monarchist times - in fact, many of the very basic ideological tenants were enshrined in that context, among the Ludwig von Mises clique (Austrian school). Why are socialism and democracy considered antithetical to monarchism as the liberal threat to kingdoms in 19th century Europe? Because in populist systems, power is expected to seek legitimacy in the form of consent from those governed. Capitalism is the ubiquitous form of the propertarian societies, which allow unbalanced, illegitimate power, and hence, fit the undemocratic models of state. The impunity of police to kill has finally been proven in public opinion, with repeated high-profile killings culminating in special coverage from the Washington Post - perhaps for the first time, fatal shootings by police have been tracked by a national institution (the government does not see a need), and the newspaper found that 987 people were killed by police in 2015. In the pursuit of justice, you don't just die in the streets. You might survive the encounter on the street, but once arrested, you will have to pay a sum likely to be unaffordable to you: 50% of Americans cannot afford a $400 emergency expense. Costs vary widely by location, but in many, bail is never that low - prompting the purchase of a bail bond, which costs 10% of the total bond, assuming you make it to court. Survival in jail is hard - but justice is still moving at this stage, in the form of jurisprudence. Anyone who has been to traffic court recently has witnessed first-hand how little evidence a judge or prosecution needs to determine guilt. Two excellent examples have been media sensations: recently, Making a Murderer proved that even tampering with evidence, planting testimony and misleading (in fact, explicitly incorrect) expert testimony can be treated as admissible and accurate evidence, even with a rigorous, experienced defense team directly challenging that evidence. Making a Murderer presented a chilling reminder of just how unreliable police/prosecutor testimony can be: the very same methods used to try and convict countless people for supposed "Satanic Ritual Abuse" in the 80s and 90s were in use in the early 2000s. Detectives, knowing that their interviewee was not likely to provide corroborating testimony, coached and led their susceptible witnesses to provide the statements they needed for a conviction. Often the interviews eerily remind of the techniques used by teachers and parents to coax the right answer out of a child: if they say they didn't do anything, you tell them they are lying, and remind them of what you want them to hear. Precisely the same drama plays out in making a murderer: a damning video of an interview with Brendan Dassey shows him being guided and pressured to make specific claims, and told he is "lying" when he fails to do so, or when he states that those claims are wrong (as he usually does, at first). The same video is shown, played for a jury - however, excluded is the portion before and after the "confession" where Dassey explicitly denies those claims, and is chided for doing so. In the case of Satanic Ritual Abuse, the introduction of videotaping as a standard for witness interviews initially served to prove just how easy it was for the testimony to be contrived, and it led to many exonerations and acquittals. the prosecution responded by advising interviewers to selectively record interviews, to develop higher "quality" evidence - that is evidence which is cherry-picked and biased. The military is set to try Bowe Bergdahl for "desertion" and "misbehavior before the enemy." Like Steven Avery, Bergdahl has been tried publicly already - to such an extent that all (or nearly all) current contenders for the US presidency have weighed in on the case. Popular opinion holds him responsible (not unlike Snowden) of additionally endangering the lives of soldiers attempting to find and rescue him. In fact, that became a secondary goal of all missions in Afghanistan at the time. The effect is to treat every mission in the interim as if he was responsible for its outcome. It's like a corollary of collective punishment - but it should make it easy to apply capital punishment to every case where an outlaw is AWOL for any length of time. This tangential relationship between responsibility and culpability is precisely the absurdity that justifies why tribesmen with no access to electronic media could be treated as collectively responsible to capture and deliver Osama, lest they suffer bombing raids. In fact, that is precisely the justification that was used for this example of a war crime - collective punishment. "John Heuer met Bergdahl in August at a “veterans for peace” convention in San Diego. The war has failed to achieve critical objectives such as a sustainable, legitimate central authority which could rout the Taliban. It has demonstrably heightened certain crises - such as drastically increasing illicit opium output from within the state's borders. These failures are palatable, and the public nature of the Bergdahl case makes impartiality an unlikely burden for jurisprudence to meet. Today on All Things Considered / Barbershop: guests congratulate themselves for their sympathy for Nikki Haley (who does not use her Indian first name) in the face of "racist" demands that she take up Indian-American issues. They assert their liberalism by defending her right to ignore Indians - much like she can ignore the rights of women, despite being one, and perhaps you would be a sexist for demanding she support women's rights, as the representative of them in her state. This is the new social liberalism - your right to be a part of racism and sexism, because those are "free thoughts" even as policy. There is another common form for this social liberalism - the idea that committing war crimes is a protected liberty. When the Kunduz MSF hospital was bombed for an hour, the US asserted that there were active Taliban fighters in the facility, and Afghan forces had requested the strike (initially, they said it was to defend US forces). Once the internal "investigation" was completed a month later, it was determined that the strikes were a mistake, and that the US would "never intentionally target" such a facility. In fact, the very crew members who carried out the attack questioned its legality at the time - a fact that seems to contradict the investigation's findings, that instrument and intelligence failures led to the "mistaken identity" of the facility. "The AP also reported on Thursday that, before the bombing, U.S. special operations analysts had been gathering information on the hospital compound because they believed it was being used by a Pakistani operative to coordinate Taliban activity during the battle for Kunduz. It’s not clear whether the crew on the plane or the commanders who ordered the attack were aware that this intelligence was being gathered, but it is further evidence that the site was known to U.S. forces as a hospital." Yet one more example rests in this passage - the "uncertainty" surrounding the crew's knowledge of such intelligence. This level of benefit-of-the-doubt, plausible deniability, and more broadly the right to act criminally, with impunity, reveals a philosophy of human rights obsequious and defensive of one class of people: the government and military of the US. Of course there is no need to determine if the crew was or wasn't privy to an investigation which might lead to an illegal bombing on the MSF facility. That is the kind of responsibility-buffer that was rightly dismissed in the Nuremburg trials of Nazis who took part in genocide. Where there is evidence of collusion and direction from administrators, their curation of that evidence should be treated as untrustworthy. When the media covers potential abuses by the military, and they are given two conflicting stories of an illegal attack, they should be treating the military as unreliable and questionable. Instead, we have the rights of the powerful as the only determinate factor in the agenda of the news, as well as the standard for prosecutorial bodies which are responsible to hold the military to account. The notion that a newspiece should defend the rights of a military to plausibly justify killing civilians, or the notion that anti-Indian and anti-women policies can be justified as a freedom of Nikki Haley, are slaps in the faces of victims of war crimes, immigrants and women. It means the prosecutors and media in question do not work for these groups, but only to defend attacks on them. Further, it is a level of sensitivity to rights which is quite extreme - extending freedom of conscience to representative/executive bodies - and, crucially, applied to the very group which has a responsibility to *not* abuse their power - whose sexism, racism, or criminality is much more than words, but even deadly. In politics, it is right to demand that women, minorities, and civilians be protected where they are at risk. No ethnic makeup of a politician, or military maneuverability needs, can free them of their responsibility to represent a pluralist society, and act lawfully. It's no surprise Al Jazeera America is closing down - from the start, the network was botched. They adopted a condescending political tone in line with the standard US media bias, they headed the network with a marketing exec more concerned with public relations than journalism, and senior employee(s?) practiced sexism with impunity. On top of that, the higher-quality content from Al Jazeera English​ was blocked in order to force current viewers to switch to AJAM. However, there was never an incentive (barring convenience) and AJAM frequently carried AJE programming (increased when AJAM was downsized), while the American network frequently experienced technical and quality problems - sometimes obviously the result of sloppy editing or under-budgeted maintenance. Journalism-savvy consumers who do not subscribe to cable - which is a deeply entertainment-oriented medium - were completely disregarded. The one consumer species I believe AJAM could have succeeded with was the financial professional. Look to Reuters, the Wall Street Journal and Bloomberg for proof that excellent investigative journalism can be supported by focus on, and support for, the stories and analysis important to the finance sector. While Palestinians have offered increasing rewards for the state they have a right to, Israel demands recognition (though it has expanding, undefined borders) and refuses to make specific offers, because they are afraid the Palestinians will "ask for more" - that is a larger percentage of the rights they have already been refused by Israel. However, simple principles, should they be implemented by the international community, would easily resolve the matters considered pressing. Having a reasonable position on the Palestinian State is a critical moral imperative. As Norman Finkelstein would say, "people like to drag in the kitchen sink" - but if we keep it simple there are important, reasonable standards which can and must be implemented. 1. Palestinians have a right to security, control over their lives and the land the UN and int'l law say they can keep. 2. Israelis have a right to security, control over their lives and the land the UN and int'l law say they can have. Palestinians have a right of return under the law - which includes land within the pre-67 borders. 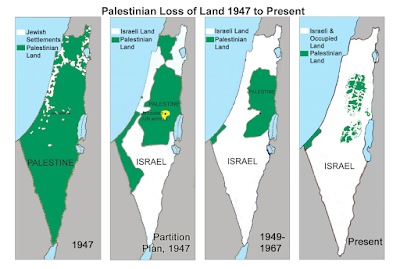 In negotiations, they have offered to renounce that right (and give up much land already taken illegally by Israel). As Dennis Ross (Clinton/Bush diplomat) pointed out, it has always been the Israelis who refuse to explicitly state what they want. They claim they are afraid that it will "never be enough" for the Palestinians, who will push back. But the opposite happens in negotiations - the Palestinians offer more and more, and lay out what they would give up. The Israelis bring maps that the Palestinians cannot even take with them, demand recognition of their state (not offering the existence of a state for Palestine - let alone recognition), and do not declare their own borders. This is while Israelis continue to seize more land in the West Bank ("facts on the ground"). Who could recognize a state which is *at that moment* taking your land (as happens during negotiations)? Noam Chomsky pointed out that coalition aggression in Iraq was a "supreme international crime" echoing the Nuremberg trials, because contained within that crime was the "accumulated evil of the whole." If that is true for Iraq and Poland, then in Palestine the "supreme crime" is the illegal occupation, and the illegal wars to defend that occupation, because contained within them are the murders, expulsions, ethnic cleansing, genocide, resource, land and tax/aid theft, the destruction of civilian infrastructure ("Dahiya doctrine") and democratic governance / sovereignty, the razing of cultural sites and the strangulation of the economy. Palestinians are utterly defeated - evident in the desperate attacks occasionally seen. Israelis are defeated, too - they are a people who usually want peace captured by a clique and state which 1. wants occupation and cleansing wars and 2. implements policies meant to maintain the same. The law can and should be implemented - it is simple and agreeable. Even the proclamations of Dennis Ross, that the Israeli's "won't say what they want" does not justify the continued crimes. Palestinians are offering to give up their rights - Israel just knows it can get more. They have to be forced to accept what they have already taken as enough. Today there is a trend which is dangerous to human life, and the safety and legitimacy of police. 809 people have already been killed this year by police. Police have increasingly been trained to act confrontationally, to hold the public at bay and to escalate situations; they more readily use force, often upon a public which is not threatening. Prosecutors and judges frequently treat flagrant crimes - everything from assault to murder - as legal uses of force. But this is not making police safer, it does not improve their effectiveness, and it is not legitimate. I have my own ideas about how society should be organized, but frankly, I am not invoking them in this issue. I am not talking about the exploitation of labor or of the US imperial state because I don't need to, and its not really relevant (even though people like to Drag In The Kitchen Sink on such popular issues). We don't need a socialist revolution before things can change - the principles enshrined in our own government, and the rule of law, could save these lives. 2. Train police to act legally and legitimately as integrated members of the communities they police. Police need to be held accountable where they are breaking the law. Of course this goes for everyone, but in the case of police, they are frequently not held accountable for their actions. The legislative and judicial policies which enable this undermine the rule of law; those polices are therefore destabilizing and illegitimate. This is an example of checks and balances; where judges and legislators fail to enforce the law, and even enable dangerous police practices, they fail their mandate to uphold the rule of law and to act in the interests of the public. Enforcing the law should be easy - those who do not commit crimes do not deserve to be assaulted or detained. This includes pepper spray and "kettling" tactics which represent assaults and attempts at escalation, respectively. It is lawfulness and de-escalation that legitimize policing. Police should effect safer and more lawful conditions in society. On top of not breaking the law, police should act to bolster their legitimate place as protectors and benefactors to society. This means police should be a part of their community - communities controlled by outside forces become resentful, reducing the stature, role and the effectiveness of police. Officers who flagrantly violate the law set bad examples, and can make citizens fearful of going to them for help. Even actions which only target criminals, but are disproportionate, can chill citizen reporting of crime - if you expect officers to assault or even kill someone you report for committing a crime, a sane person will be discouraged from reporting the crime, especially if they are friends, neighbors or family members. Police presence should reduce crimes, assaults and deaths. If that is not the case, the police do not have a mandate for their position, and/or the policies which govern police behavior and oversight are incorrect. This is utterly reasonable, and a sane alternative to current practices. Removing dangerous people from society is not something that is increasingly dangerous in the US - quite the opposite - and it does not call for murders and assaults. And of course, this reasonable framework has already been hammered out - at a time when policing was undeniably more dangerous in the US. Our police should be trained to act legally as integrated, helpful members of society - an attitude I have actually heard from police. Prosecution for crimes is, of course, not controversial. Anyone who disagrees with this is basically rejecting the rule of law, and founding principles of our republic. I've met police officers who have surprised me with their generosity and who do not fit the bill of a "brutal cop"; many are not sadists and don't want to commit crimes. Maybe even discussing the basic role of police in society has its place, but I don't think it is here. Today we are confronted with a massive loss of human life which could be saved, and it shouldn't require major reforms. Of course I don't think we will achieve justice and stability simply by these reforms. It is possible these policies will prolong an illegitimate state which does not extend democratic oversight to the economy (see the "marxist" Make Things Worse To Incite Revolution argument). However human beings are dying, today, when current laws and policies can prevent that. It is plausible to say that loss of life in a revolution may occur, and we should not avoid revolution on account of that. But it is not legitimate to advocate for worse conditions, or unreasonably radical conditions, when a consensus-driven approach can save lives and improve standards of human rights. Even if you think the state is illegitimate, the reality proves that a safer existence is a possibility, should people demand it in reasonable terms. Human life, human rights, and the possibility for a safer society based on heightened respect for individual civil liberties is worth fighting for, even if it is not a panacea. The rocket attacks from Gaza must stop. That is a fact of law (they indiscriminately target, mostly missing of course). It is also a moral and political fact. Human beings have a right to a life free of such attacks. The deployment of projectiles can make places uninhabitable, and kill many. It is true that Palestinians have a right to resist occupation - and then, follow the laws of war. Within reason - if a law states they must leave their cities and homes and go to the countryside as an open target for Israel - no people can be expected to lay down and die, or accept occupation and a strangling blockade. Guerilla warfare is urban warfare - and legitimate cases of human shielding, i.e. deliberately firing from facilities like UN Hospitals and Schools - have had next to no occurrence. While many cases, including photo evidence prove Israeli human shielding of captured Palestinians, there is next to no documented evidence of Hamas doing human shielding - and this is during the very wars in which that excuse was used by Israel to kill many Palestinians. This wholesale destruction is leads to barriers to peace. The Palestinians do not get to ascend the skies and make the option of leveling Israeli neighborhoods. The primary barrier to peace is the deployment of projectiles against Palestinians, and all of the institutional and physical destruction that reduces their ability to develop peacefully, kills them, and engenders hostility among the survivors. Any cost to resolve grievances, and the responsibility to stop the destruction leading to those grievances, is vastly owed by Israel. But that cost is actually cheap for the Israelis, because it is mostly paid by returning some Palestinian sovereignty that Israel didn't have the right to take in the first place. There is human life lost, and we must hold those liable not to do it anymore. That is a basic, reasonable principle. And its application means an end to Israel's vastly enumerated polices of occupation and destruction. I propose that we stop both sides from committing crimes against the other, and respectively require that they cease making casualties and destroying things in the opposing territory. We should stop each of the the humanitarian crises existing there, and allow a state to flourish legitimately in each, etc., etc. Where death, especially on racist terms, is the consequence of their policies, all of these administrations - Israel, PA and Hamas - must obviously change. In each case, it does threaten their legitimacy - which is more destabilizing where the economy is a basket case. External sanctions/actions may be reasonable - but the key, of course, if you care about human rights, is to address the most destructive institutional racism first, and insure that all populations have a space to exist, protected from the destruction wrought based on identity/territory. Neither side has the right to make life hell, and destroy life for the other on an indiscriminate basis. That is collective punishment, targeting of civilians and civilian infrastructure. Those are all illegal acts. They make peace with such an actor increasingly hard. By some absurd stretch, the parties *broken away from Hamas' chain of command* can be said to do some of that to Israel. Israel is making peace impossible. It is by and large Israel which must change - its policies, the crimes, etc.. All these metrics point to the fact that Israel is doing everything in its power to prolong the conflict: it is engendering bad faith, more destroyed lives, ruining the Palestinian economy so they cannot be independent, denying statehood bids while - toppling, illegally, the democratically elected government of Palestinian Territories. There is no stronger way they could send the message: "we don't want peace, we want a non-stable state actor on our border that cannot possibly represent a partner for peace, because we have made sure that the elected representatives are dead, imprisoned, dethroned. But they have it in their own words. Today, NPR had a favorable review of Dennis Ross' new book "Doomed to Succeed" (the topic: his work on just this issue for the last 3 administrations). In this segment, Siegel agrees with Ross: "[during each peace process], the Israelis waffle, can't quite describe what it is that they really want." Ross says Israelis are afraid that, should they explicitly state what they want in negotiations, Palestinians will use that to ask for concessions that erode just what the Israelis would ask for. However, Palestinians have provided unprecedented concessions. They have agreed to let Israel keep most of their illegal settlements in the West Bank. They do not ask for compensation for their incredibly destroyed economy (by blockade which limits basic needs, withholding electricity which kills and sickens, and by the consequences of materiel invested in destroying Palestinians and their buildings indiscriminately). And Hamas, now has repeatedly agreed to form a coalition with the PA, granting the PA most power, and recognizing Israel. Even though Israel will not even declare borders, they are granted recognition by the very state they have been seizing land from (an element of them "not telling people what they want" remember). What an unprecented set of demands to put at the door of the population who overwhelming bear the death, subjugation and thievery in the conflict. The refugees are likely to ultimately concede their legal Right of Return - a massive concession that provides Israel with a territory that does not have to consult, or allow in many of the natives to that state. What must the Palestinians stop? There are "rockets" (which do some damage, and should not be used indiscriminately - lets be fair) but they do not destroy the Israeli government. There is not a delegitimized, non-state actor in Israel as a consequence of the Palestinians' actions (it is the other way around). The Israeli economy is not a basket case (the Palestinian economy is dire - bad in the West Bank, and at humanitarian-crisis levels in Gaza). A small percentage of Israelis experience a skyborne threat, which has a psychological toll, a property damage toll, a human life toll, and yes, a grievance which impacts the peace process. But that does not cause damage at even a modicum of the rate from the repeated leveling of housing, hospitals, schools, mosques (73 during Protective Edge) and of course the other destructive policies which Israel illegally implements upon a people it has no right to control. That is actually the point. To make a safe area that each population can thrive in. We shouldn't have a hard task in front of us, though. There is no mythical, unknown formula to provide for self-determination and co-existence on a basic level. It means to follow the principle: neither side has the actual power to create a humanitarian crisis next door. Where this is most egregiously incorrect - fix it. Follow international law. -when peace can actually start. I say the second point for this reason: the actions committed against Palestinians not only delegitimize the Palestinian State, (creating the false "no partner for peace" narrative), they also increase grievances and create more hardliners in Palestine. Would you be a hardliner if your entire neighborhood was leveled? Most people I know claim violent intent at far less instigation. Abuse on such an extreme level is incomprehensible in how ugly a response can get. That is why racism is so common in such conflict zones. Like in Iran during the Nuclear negotiations, hardliners are those elements of civil society that want no compromises. In Palestine, they will specifically reject the kind of compromises that the PA has realized it will need to give to placate Israel. The rate of Israeli peoples being punished, killed and abused by Palestinians is absurdly low compared to the opposite metric - these barriers to peace must be stopped. Make the Israelis stop abusing an occupied people and thereby erecting barriers to peace. Make them stop stealing land, oil, water, and burning olive groves, leveling Palestinian heritage sites, homes, and institutions of all sorts. Those concessions can be provided to the Palestinians with comparably negligible cost to Israel. That is mostly in their stopping stealing. It would be offset with saved Israeli money, but the occupation is cost-negative for Israel. They profit from the occupation. That metric must change. And it further proves just how little Israel wants to stop their occupation. Which - like much of what Israel does to the Palestinians - is illegal. It is not needed for defense. It is a far stronger argument that Palestine should occupy and stop Israeli incursions and crimes against Palestine - that is what the numbers say. It is not a lot to ask for, and it is that which any population demands of an occupier: let me live. I am allowed to live and thrive and be free. That is huge to the Palestinians - and it costs barely a bit. 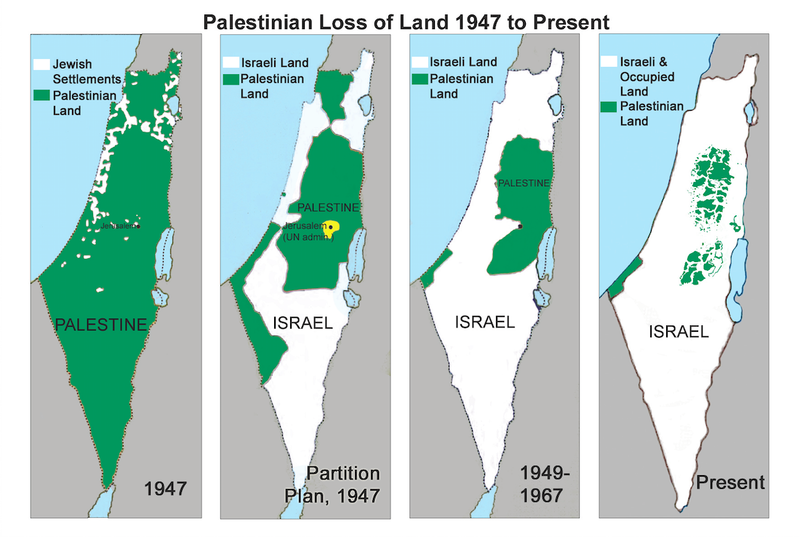 That bit is something the Israelis don't have a right to anyways: the sovereignty of the Palestinian Territories. The world is better served, more secure, and safer if Palestine is allowed a stable state and economy, safe from bombings and theft now customary under, and from, the occupation. Ross agreed with Siegel when he said that the Israelis are never willing to state just what they want. "ROSS: Right. And there are conversations with Henry Kissinger and Abba Eban in 1971 that is almost exactly the same as the conversation the Hillary Clinton had with Bibi Netanyahu in 2011. The reality is that the Israelis are always afraid that if they give us a bottom line, when we go to the other side, it won't be good enough. And then we'll come back to them, and we'll say, sorry, not good enough. And so they hesitate about going down a slippery slope." The Palestinians have exactly this problem - the difference is that their dire situation demands that they make concessions by giving away their rights - the right of return, and the lands, water, buildings etc. that Israel already has taken illegally. The Palestinians have offered to let Israel keep what it has illegally taken. Other losses, the loss of life and economy, can never quite be repaid, and will not see monetary compensation either. That is what is reasonable. We should at least stop the destruction. Allow for legitimate representaion in order to negotiate with each population. That means Hamas at the table too - the current context has a detente between the PA (nominally Fatah) and Hamas, with recognition being offered. That is what Israel keeps saying they want - words. The real sticklers for peace? "The constitution of Hamas" and not "Recognizing Israel as a Jewish State." Well, Israel has not only not recognized the Palestinian representatives when they were elected, they destroyed the government. Lets's set this standard: you can ask for your negotiating partner to stop taking something from you - i.e. they are destroying a state or an economy - those are legitimate grievances, quantifiable, and barriers to peace. There is no grievance when your complaint is just that the other doesn't "recognize" your state. Israel consults, and is bound by no Palestinian when it sets the laws of its established - legal land. Those are mostly the territories occupied before 1967 - but be clear, they will get to take more. Palestinians have agreed to that. Israelis need not make any such concessions - they are not under occupation from Palestine. The mere fact of Israeli might does not allow for such disproportionate, indiscriminate and collective destruction. That is illegal regardless of purported prompt or goals for Israel. Any policy which seeks to stop these crimes builds a path to peace. That is basic arithmetic. Further Reading: works from Norman Finkelstein, Noura Erakat, Noam Chomsky, National Public Radio (Morning Edition, All Things Considered, On Point), al Jazeera English and Haaretz are all quite instrumental to understanding the conflict. AJE reporting on Palestine Papers, and Amnesty Int'l / Human Rights Watch / B'Tselem provide good documentation of negotiations & abuses and barriers to peace , respectively. ©2011 Dean Sayers. All Rights Reserved. Simple theme. Powered by Blogger.